Salman had played a taciturn wrestler in Sultan, so the audience got the idea—incorrect as it turns out—that the crowd-pleasing superstar was willing to play mature roles. 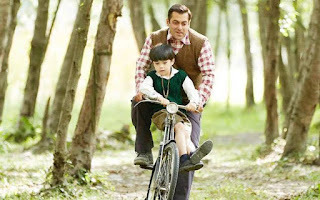 However in Tubelight, he plays Laxman, as a child-like, slightly retarded man, the townsfolk in his Kumaoni village tease with the chant, “Tubelight, jal ja.” The film is based on the English film, Little Boy, in which the protagonist was a child, susceptible to taking simple homilies like “Faith can move mountains” literally. The Forrest Gump kind of role simply does not suit Salman, who keeps trying different ways of scrunching up his face to cry or popping his eyes out in the attempt to look cute. Laxman’s beloved younger brother Bharat (Sohail Khan), who looks after him, enlists in the army when the Indo-China hostilities break out. As a kid Laxman was given a lesson in the power of “yakeen” (faith), by none other than Mahatma Gandhi; in the present, a visiting magician (Shah Rukh Khan in a charming cameo), convinces Laxman that he can do anything if he believes he can. So Laxman believes with all his might that his faith will bring his brother back (which rather cruelly implies that those who lost loved ones in the war were lacking in faith! ).